This image shows a side-by-side comparison from from NASA two infrared instruments of CO2 ice at the north (left) and south (right) Martian poles over the course of a typical year (two Earth years). This map of an area within the Arabia Terra region on Mars shows where hydrologic modeling predicts locations of depressions that would have been lakes (black), overlaid with a map of the preserved valleys (blue lines) that would have been streams. Valleys much younger than well-known ancient valley networks on Mars are evident near the informally named 'Heart Lake' on Mars. This map based on NASA's MGS data presents color-coded topographical information overlaid onto a photo mosaic. This map shows local variations in Mars' gravitational pull on orbiters, presenting unprecedented detail based on several years of data from tracking three of NASA's Mars orbiters. This Mars map shows variations in thickness of the planet's crust, the relatively thin surface layer over the interior mantle of the planet. It shows unprecedented detail derived from new mapping of variations in Mars' gravitational pull on orbiters. Newly detailed mapping of local variations in Mars' gravitational pull on orbiters (center), combined with topographical mapping of the planet's mountains and valleys (left) yields the best-yet mapping of Mars' crustal thickness (right). This map of Mars indicates locations of new craters that have excavated ice (blue) and those that have not (red). 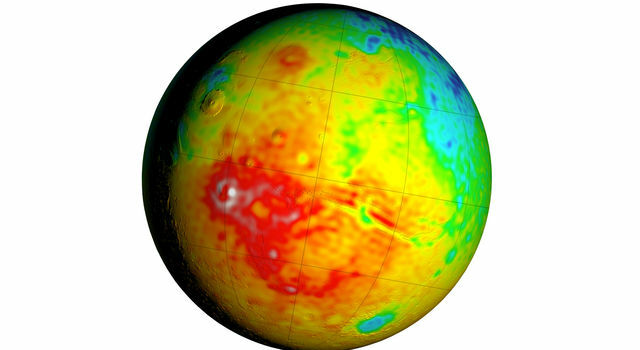 Albedo information comes from NASA's Mars Odyssey orbiter, and the map comes from NASA's Mars Global Surveyor orbiter. This pair of maps based on albedo information from NASA's Mars Odyssey orbiter and topographical information from NASA's Mars Global Surveyor orbiter indicates locations of confirmed sites of recurrent slope linea on Mars. InSight will study the Red Planet's interior to advance understanding of the processes that formed and shaped the rocky planets. This radargram profile from ESA's Mars Express and NASA's Mars Global Surveyor orbiter shows data from the subsurface of Mars in the ice-rich north polar plateau of Mars. Color coding in this image of Mars represents differences in elevation, measured by NASA's Mars Global Surveyor. 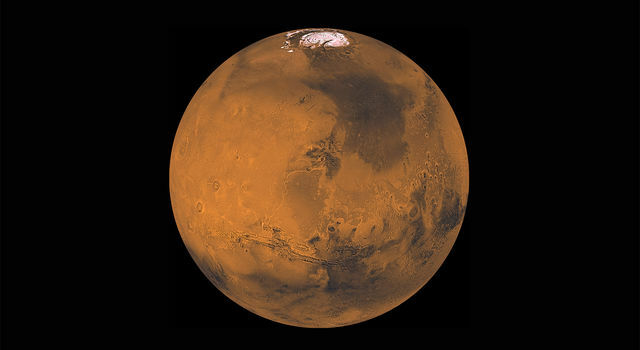 While surface liquid water is rare and ephermal on modern Mars. This computer-generated view based on multiple orbital observations shows Mars' Gale crater. 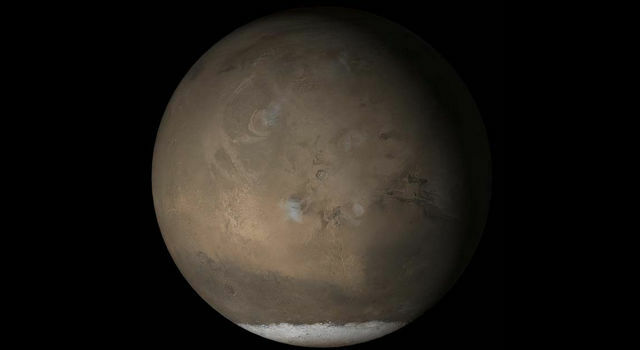 NASA is considering Gale as a possible landing site for the Mars Science Laboratory mission. This image from NASA's Mars Global Surveyor and Mars Odyssey spacecraft shows the context for orbital observations of exposed rocks that had been buried on Mars. The area is dominated by the Huygens crater, which is about the size of Wisconsin. On this map of Mars, spectrometers on spacecraft orbiting Mars have detected clay minerals (green) and hydrated minerals -- clays, sulfates and others (blue). This view of Lyot Crater is a combined mapping by NASA's Project Viking with elevation information from Mars Global Surveyor showing at least one of the nine craters in the northern lowlands of Mars with exposures of hydrated minerals detected from orbit. This image indicated NASA's Phoenix Mars Lander landing area on Mars to a topographical map indicating relative elevations in the landing region prior to landing. The elevations could have affected wind patterns at the site. This map shows the landing site chosen for NASA's Phoenix Mars Lander. The site is much farther north than the sites where previous spacecraft have landed on Mars. NASA's Mars Global Surveyor shows regional landscape near Mars' south pole called 'cryptic terrain.' Cool colors are areas with a low albedo (dark) and warm colors are areas which have high albedo (bright). NASA's Mars Global Surveyor shows Candor Chasma, part of the large Martian canyon system named Valles Marineris. This area was designated 'Region D' in the process of evaluating potential landing sites for NASA's Phoenix Mars Lander. The topographical information is from the Mars Orbiter Laser Altimeter on NASA's Mars Global Surveyor orbiter. This is an orthographic projection with color-coded elevation contours and shaded relief based on data from the Mars Orbiter Laser Altimeter on NASA's Mars Global Surveyor orbiter. This image maps out the travels of NASA's Mars Exploration Rover Opportunity, from is landing site at Eagle Crater to the rim of Victoria Crater about six miles (9.7 kilometers) away in September of 2006. Two Martian southern mid-latitude craters have new light-toned deposit that formed in gully settings during the course of the Mars Global Surveyor mission. A new map of Mars' gravity made with three NASA spacecraft is the most detailed to date, providing a revealing glimpse into the hidden interior of the Red Planet. NASA Administrator Daniel S. Goldin and a panel of senior space scientists and engineers will discuss NASA's plans for robotic exploration of Mars and, specifically, the two U.S. missions set for launch to the planet this fall, during a press briefing on Wednesday, October 16, at NASA Headquarters, Washington, D.C.